Dhoruba bin Wahad was hospitalized after the Aug. 8 attack with serious injuries including a severe concussion, ecchymosis of both eyes, deep lacerations and a jaw broken in three places that required an operation to wire it shut and insert a titanium plate to stabilize the bone. Supporters have set up the Dhoruba Medical Fund at GoFundMe.com: http://www.gofundme.com/DhorubaMedicalFund. Like others, I have had to explain to many folks, who are not aware of what the Black Panther Party was about, what our original BPP history and legacy is and what damage these thieving, reactionary mimics have done to that legacy. This makes me angry, as I am now 77 years old, with just a limited amount of energy, and I am getting tired of doing this. So, in the past, I have limited my comments to an extent, as I have always felt that these fools need to be given as little acknowledgement and public attention as possible. I have always felt that it was just a matter of time before they self-destructed. Since coming to public notice, this group has shown itself to be little more than opportunistic, treading on the work, dedication and sacrifices of others. First of all, I say there is no such thing as a “New” Black Panther Party. If this group is anything, it is a collective of racist, reactionary thugs and tools of the still-very-much-alive Cointelpro government agency. On Aug. 18, Dhoruba bin Wahad and Kalonji Jama Changa held a press conference describing the New Black Panther Party attack on them 10 days earlier. They said that when Dhoruba was ordered to be expelled, two dozen NBPP members attacked the elder activist with chairs, breaking Dhoruba’s jaw in three places and leaving him bloody and swollen with bruises. One of the others with Dhoruba was choked unconscious and another received a head wound that required staples. Dhoruba’s injuries required a six-hour operation to repair his broken jaw. But now I have had enough – they have crossed a line, a clear line in the sand. I say now, in case you are one of those people who have any doubts or thoughts of these thugs as just crazy cartoon characters, think again. 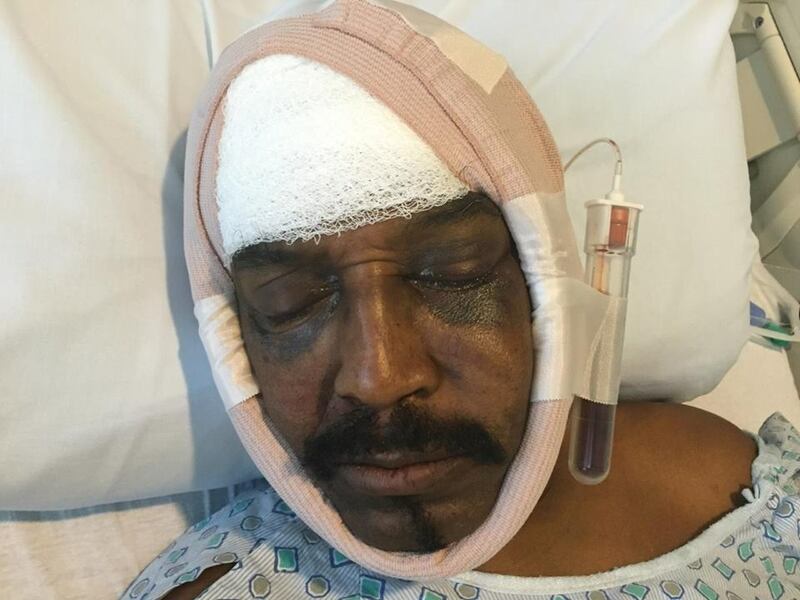 Their most recent attack on our comrade, former member of the Black Panther Party for Self-Defense, Dhoruba bin-Wahad on Aug. 8, 2015, at a conference in a downtown hotel in Atlanta, needs to be addressed in no uncertain terms. This unprovoked attack has nothing to do with the Black Liberation Movement – this is an attempt to assassinate a former BPP leader and political prisoner and his comrades, a 71-year-old respected elder, who is still an activist in the struggle for human rights for all people. What community programs have they created in all these years? What good have all their racist epithets or their military-style formations in black uniforms done our Black communities? What kind of learning institutions or medical centers have they opened? The so-called New Black Panther Party has proven itself to be one which consists of agents for the corrupt system designed to undermine the legacy of the Black Panther Party. Although they stole our Ten Point Platform and Program and then twisted it for their own negative purposes, they have no political consciousness, no program or agenda for serving the community, the Black race, or any oppressed people. On the contrary, to scream, “Kill him, kill him!” is exactly what the U.S. government would like to see happen to all the original BPP members. Those this government could not frame and imprison for life are never forgotten, no matter how many decades have gone by. A big celebration of the 50th anniversary of the founding of the real Black Panther Party is planned for Oakland in October 2016. They continue to harass, implicate and if possible, eradicate them. By the actions of these thug, reactionary, so-called New Black Panther Party members, they have exposed themselves for what they are – agents – would-be killers of freedom fighters and the legacy of the Black Panther Party. This latest incident, their cowardly assault on Dhoruba bin-Wahad and his comrades, is indeed a wake-up call. I ask you, why is it that we seldom, if ever, hear of them being arrested, terrorized or killed by the police? The so-called New Black Panther Party should not attend any more Black Panther Anniversary Celebration events. They ARE banned. However, no matter what these opportunistic, headline-seeking, would-be thieves of our legacy attempt to do, they will not succeed. Their antics and actions cannot eradicate those contributions to history created from the lives lost, the blood which was shed, the decades suffered in this system’s dungeons and the daily struggles, hardships and self-sacrifice of the members of the original Black Panther Party. No matter what these opportunistic, headline-seeking, would-be thieves of our legacy attempt to do, they will not succeed. Our history and legacy has lasted almost 50 years and will last another 50 years – and beyond that, forever. I say again, as always, true power lies in the hands of the people and I wish you all well, comrades and community members. Elbert “Big Man” Howard is a founding member of the Black Panther Party and is an author, lecturer and community activist in Sonoma County. He can be reached at bigman0138@aol.com. A note on YouTube says that this video “serves as our official statement” and asks viewers to direct all questions and concerns to defendingthepoor@gmail.com or newafrikanpressint@gmail.com. ‪#‎hardtruth‬ Some of the BPP elders have mis-placed aggression. You should be mad at the ones who shut you down, not those who picked you up! The struggle did not stop in the 60s or 70's its worse now. Hello big man my friend this is James Pratt from Tacoma Washington. As an conscious and informed person knows any leader regardless of race that had an agenda to improve the plot of the least of these, and particularly peoples of color was annihilated, as in wiped out, killed. This reign of heinous terror and murder included the murders of Jon F Kennedy, Malcom X, ML King, JR., Robert Kennedy, Lil' Bobby Hutton, Bunchy Carter, John Huggins, Fred Hampton and yes Huey. The list goes on ad infinitum. These warriors were eliminated because as J Edgar Hoover said THE Black Panther Party was the greatest threat to the internal security of ameriKKKa. The very fact that the NBPP has experienced no such terror just confirms that the group is complicit with the powers that be and the perpetrators for the advancement of empire. Let The Black Nation in America be clear. Louis Farrakhan's movement is not The Nation of Islam. Elijah Muhammad's movement is The Nation of Islam. Messenger Elijah Muhammad's movement has been equally as highjacked as The BPP takes the position that its movement has been by The NBPP. Is it a wonder that the man often accused of highjacking the BPP's movement is the former top Minister of Louis Farrakhan? Minister Khalid Abdul Muhammad wished nothing whatsoever more than to represent the movement of Messenger Elijah Muhammad. His movement is neither racist nor reactionary and nobody in their right mind can seriously question what programs he set up for our people. It is not racist to call the white man devil because that is what he is whether you like it or not. You can't prove he's not and he consistently proves he is. Muhammad's Temples of Islam teach and train our people into the knowledge of self and the doing for self that represents the highest of proactive efforts to lift the condition of our people. Louis Farrakhan highjacked Messenger Elijah Muhammad's movement and pushed Khalid Abdul Muhammad out of that movement for refusing to soften his position with respect to the core values of Messenger Muhammad's movement. This is why he was even available to "highjack" your movement. He brought Nation of Islam ideology to the NBPP because that is what he truly believed in. He should never have been forced out of the place where that ideology most properly belongs, which is The Nation of Islam. His misplaced love for and loyalty to Louis Farrakhan would not allow him to do what he should have done, which is set up a real Nation of Islam and expose Louis Farrakhan for the hypocrite and liar he is. This was a costly mistake on his part. It was not an ill intentioned one though. It was also a mistake, but not an ill intentioned one I believe, for Bro. Aaron or whoever asked Bro. Khalid to join and or lead the NBPP to do so. Bro. Khalid's heart, mind, and soul were with The Nation of Islam. Under such conditions, one cannot truly be representative of the ideology of an entirely different movement with an entirely different ideology and focus. He could only do what he did, which you characterize as "highjack" the original BPP. Now fast forward to 2015. Malik Zulu Shabazz takes the movement you say has highjacked your movement right back to the liar and hypocrite whose wicked dealing of Khalid Abdul Muhammad made it possible for Bro. Khalid to come to power in the NBPP in the first place. Is it any wonder all this insanity has taken place? The Nation of Islam was highjacked by Wallace D. Muhammad in 1975. Farrakhan was his Chief Spokesman in this highjack. It was Wallace D. Muhammad whose wicked dealings against his father eventuated in the assassination of Malcolm X in 1965. 10 years later, he highjacks the Nation of Islam all together and destroys it. Farrakhan then, 3 years later, leads a breakaway NOI highjack movement from Wallace's NOI highjack movement. Once the jack got to high for Khalid to handle, he was forced out. Once he was safely out of the way, in pops Malik who immediately cozies up with the Chief Jacker of this day and time Louis Farrakhan. Whether you like it or not and whether you agree or not, our two movements are inescapably linked to one another. I, however, wish to see the philosophical and ideological integrity of both movements restored to their original purity. The only proper place for Nation of Islam doctrine to be preached is in Nation of Islam Temples by Nation of Islam members. The only proper place for BPP "doctrine" to be taught is in BPP chapters by BPP members. If we can work in unity and brotherhood, that's fine. If not, that's also fine. But we should not be creating any hybrid movements which seek to blend the two ideologies and philosophies into one movement which does not truly represent either one of them. I pray Allah Master Fard Muhammad in the name of his Messenger The Most Honorable Elijah Muhammad that you receive my words in the spirit of brotherhood from which I have written them. If not, Praise be to Allah, he is the best knower. And Still Are Today Part Of The BPP “BLACK GUARD UNIT”. The Military Muscle In The BPP. Although Not A Cohesive Force Today, This Special Military Force Of Our Party Still Exist Today In 2015. Undet My Active Leadership. Just So You, And All My Comrades Know This Fact. Genetal Houston. Please delete the above post. This article is biased and not a completely accurate account of what happened that day. There will always be criticism from one generation to the next on tatics especially from an era that was heavily romanticized but ultimately cut short and many of its workers were killed or paid off. The torch was not successfully passed and it shows. What happened that day was unfortunate indeed but the way it was handled on BOTH sides has much room for improvement. Eyewitnesses assert the presence of weapons Dhoruba and his posse had. Their account even minimizes the intent of verbiage obviously used as seen and heard on video. That incident is nothing either party should celebrate but what if the men who had been successful in the assassination of Malcolm X been stopped and in the process rather beat up … would the people who stopped them be heralded as heros or as unprincipled thugs fighting our own people? Furthermore the NBPP has worked WITH him and several other BPP original members in programs, not all former BPP members are against Nbpp, it is also untrue to assert no consistent work is being done on their behalf within the communities they live i know of several factions doing work regularly . I am not a member either btw i just dont believe the truth is subjective or based on opinion but instead on facts. From an Original Black Panther, this group is an affront to the leaders and soldiers of the Only Black Panther Party and that being of Huey P Newton, Bobby Seale, Angela Davis, Elridge Clever and those party soliders. For this group to use the Idealogy and Doctrine for the Original party is an affront. They need to read the 10 point platform and find the True meaning of being a Panther. This may help them to establish programs as did the Original Black Panther Party. Top many chiefs and not enough indians. Who want to be glorified and live off greed and corruption. Glorify the black man to rule over himself. You can walk in a complete circle and all you see is the white man laws and land. I’m part Indian n that side of the family tree fought to the end. That’s true freedom of death. You don’t understand the Indian genocide because you told only what they want you too know. Dhoruba and the original BPP are to be commended and recognized for the work that they have done on behalf of black people every where. BPP has a rich strong legacy, which many others to this day still follow. There are many regiments, with the word black, word panther or some combination of the two. The New Black Panther Party is probably the best well known. The word "New" clearly distinguishes the original from the new group.. Sometimes the torch is handed off sometimes some one picks it up, sometime it's even taken. Though the disagreements of some members of both parties obvious. There some members of both determined to work together. The long standing feud between both of these groups only serve the purpose of our common oppressors. It is in the best interest of all the oppressed for the BPP and the NBPP to work together. Help bridge the gap between the young and the old, old and the new , blood and the red, and other warring fractions. Lead by example. What a tragedy travesty and a heinous act that was committed on Brother Dhoruba!! He is an elder an icon in our struggle for justice and equality!! TNBPP should be ashamed of themselves!! Bro . Khalid Muhammad is turning over in his grave!! Actually there were three versions of Black panthers!! The first being the original BPP started by Huey Newton and Bobby Seale. The second version was The Black Panther Militia in Milwaukee started by an original Panther Commander Mike McGee Sr. And now the third version the so called New Black Panther Party!!! The NBPP needs to get on board with the doctrine of the other two and unify!!! They are so infiltrated that it is a nest of cointelpro! !